This RAID 6 had failed a couple of years ago, but due to lack of RAID and NAS expertise the organisation were unable to repair it and bring it back online again. At some point an attempt was made to image all the disks but several mechanical failures were reported. RAID 6 is very similar to RAID 5 but with more data protection. With RAID 5, one of the hard drives that make up the RAID set can fail without any loss of data, on systems that run RAID 6, two drives can fail. 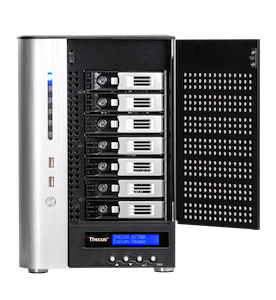 Thus for the most part RAID 6 systems are very resilient and provide a high degree of data throughput, making them fast and dependable machines. Our first task with this job was to determine the condition of the disks – identifying which ones still worked and which ones didn’t. As soon as we knew this we’d be able to determine what action was necessary to get the RAID 6 into a state where the data could be read from it. Several of the hard drives had mechanical issues, and it was necessary to replace the read write heads on a couple of the hard drives in the cleanroom first. Once completed the drive’s contents were imaged to our recovery server where the contents of each disk could be analysed, a task which would allow us to piece the data back together.